Music City has a new signature home event launched in June by 2012 Southern Living Custom Builder of the Year, Castle Homes. There was a whole lot of PR wonderful in this latest Forest Home Media project and here are some of the great ways to create engagement around your home lifestyle industry event. As we had introduced for the holiday Parade of Homes, we suggested the launch of a dreamy Instagram account for the award-winning Nashville area custom builder and remodeler to help engage the legions of photographers, bloggers and visitors touring. And, yes, a hashtag contest perfectly complemented this effort as well. Check out all the great pics on Instagram and more via #NashSymphonyHouse and give @CastleHomes a follow! In addition to working with all Nashville and regional media, we also went international using Periscope for a variety of fun moments which were live stream broadcast. One of our favorites was a wrap up interview with interior designer Julie Couch and floral & succulent designer Tim Riffle after their on-site segments with NewsChannel 5’s Talk of the Town. Here are the TV segments we helped coordinate as well as the fun Periscope recap. Tim Riffle, Tim Riffle Environments, weaves some succulent magic with NewsChannel 5’s Talk of the Town’s Tuwanda Coleman. Red, white and fabulous with Julie Couch, Julie Couch Interiors, was also taped at the Nashville Symphony Show House with News Channel 5 – Talk of the Town – Tuwanda Coleman. Our Periscope recap with the talented Couch and Riffle was the first Periscope for each and we used it as a great way to talk about live on tape TV interview tips. The cross-promote is one of our favorite tools when weaving a project into the conversation of a community. A cost-free opportunity we used before and during the tour event was the Tennessean’s Sunday builder, designer and architect profiles in the real estate section. Also, in April, I was asked by Franklin Life to submit a recipe – yes, we love all things food, home and garden! The awesome editor allowed me to weave upcoming projects into my bio. Franklin Life featured FHM partner Nancy McNulty’s favorite blueberry salsa recipe & listed the Nashville Symphony Show House as an upcoming project #crosspromote! We used an informative Periscope also as a cross-promo for the Nashville Symphony Show House. Periscopes not loaded to our YouTube channel have been added to the video section of our Forest Home Media Facebook page making Facebook oh, so happy with original video content. This also uses the Periscope in multiple-ways, a favorite technique of Forest Home Media when generating content for marketing. Our first Periscope broadcast was a test run at the Nashville Symphony Show House, promoting the upcoming event by Castle Homes. Another dreamy cross-promote and the ultimate was being featured on the cover of two area magazines. The fab folks at Your Williamson magazine used the Southern Contemporary Folk style home as a backdrop for their May salute to area matriarchs. It was such an honor to host these wonderful women. The magazine also included a great story on what’s cool, new and different with the upcoming premier home tour! #CrossPromoteHappiness. Finally, it is never easy and sometimes hard to communicate to clients and event participants how important pre-event photos are in creating excitement. We do a lot of front-end PR loading for an event and then encourage opinion leaders and visitors to carry the conversation forward during the event supplemented with advertising. The pre-event photos are created during the chaos of construction with a lot of people including the photographer on ladders and knees to get the perfect shot. This year, we earned a lot of great media stories including the cover of Greater Nashville House & Home with a terrific preview of the upcoming event creativity of the builder, designers and architect. You have to be prepared to have fresh content ready based on magazine deadlines or you miss this entire important vehicle. Built by Castle Homes, the Southern Contemporary Folk style home’s covered porch, with Mark Simmons Interiors’ accessories and Bennett Galleries’ art, has pops of coral, Restoration Hardware aged teak furniture, a charming fiddle leaf fig, by Priscillia’s Plants, and spring arrangement by Garden Delights. Photo coordinated by Forest Home Media w/ photo by Peyton Hoge. One of the HUGE and we mean REALLY HUGE days was the sneak peek tour and garden party for area media and home bloggers. Our talented friends Carmen Johnston, of Carmen Johnston Gardens and contributing garden editor for Southern Living mag, joined us with PBS Volunteer Gardener Troy Marden, who signed and gave participants a copy of his latest book, “Southern Gardeners Handbook.” A beautiful tea was prepared by iconic Miss Daisy King. Nashville icon Daisy King prepared a delicious tea for the Nashville Symphony Show House Garden Party for media & bloggers and gave away her classic cookbooks to three lucky bloggers. Castle Homes hosted a dreamy garden party for area media & bloggers with special guests garden lifestyle expert Carmen Johnston, iconic Miss Daisy King and author and NPT Volunteer Gardener Troy Marden seen with Castle Homes President Alan Looney & wife, Heather Looney, company VP. Author & PBS/NPT Volunteer Gardener Troy Marden autographed his “Southerner’s Guide To Gardening” for Dreaming In Color Blogger Deneen Gildwell and all the garden party guests. So many gorgeous blogs were created by the talented community of home, food and garden bloggers. 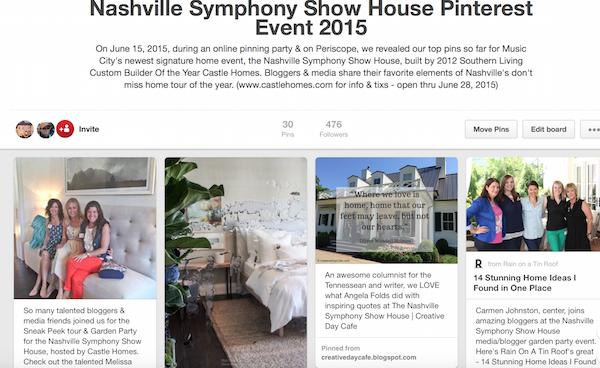 Forest Home Media once again hosted a live Pinterest party in the kitchen of the Nashville Symphony House. Before, during and after, we broadcast fun Periscopes where we talked about areas of the home highlighted by the bloggers. During the live Pinterest event from 7 to 8 p.m., we pinned beautiful images from the blogs while getting to discuss them simultaneously with folks on the Pinterest board created for the fun, engaging event. Another element we love is being able to capture for our clients a snapshot of the great profiles of the home event while exposing these talented bloggers to a new audience. From engaging society photographers and traditional media to weaving wonderful Instagram, Pinterest, Twitter and Facebook moments, Forest Home Media is pioneering for the home, food and garden industry a full-circle experience which has so many positive, lasting effects for the talented folks who are smart enough to take advantage. Can you tell it was a long-g-g-g day for Forest Home Media at the Nashville Symphony Show House Patron’s Party?! Forest Home Media intern Lindsey Locke Anderson, Junior/Communications at Samford University, Birmingham, Alabama, also contributed to this post. 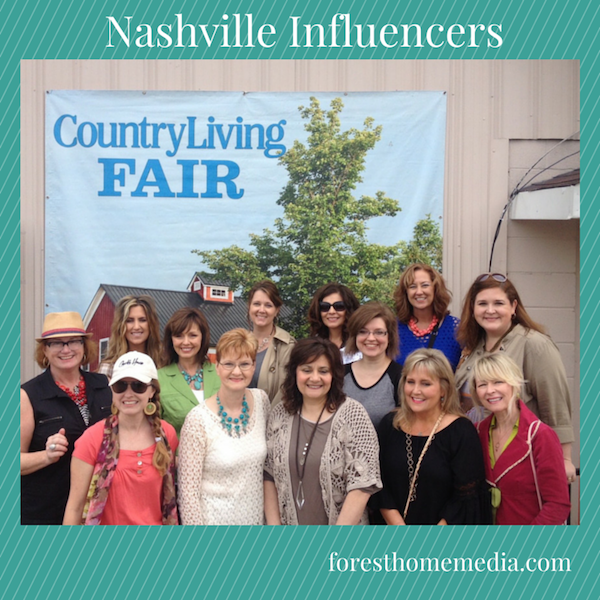 Forest Home Media in April partnered with Country Living magazine and hosted the Nashville Influencers group at the Country Living Fair: Nashville. Founded by FHM, the Nashville Influencers is a creative consortium of area media and bloggers sharing a passion for home lifestyle – home, garden and food! WTVF Talk of the Town Host & Nashville Influencer Meryll Rose, arranged a meet up with the editor of Country Living magazine, Rachel Hardage Barrett, who joined us for a Periscope live stream interview with Forest Home Media Partner, Nancy McNulty. Here’s an excerpt from that interview. What are some of your favorite things you’ve learned about the Nashville area? I am so excited to be here in Nashville because I grew up in Tennessee. Tennessee has so much going on, and Nashville has so much good energy with so many creative types. There are all these great artisans popping up, and we were looking for a good location. To me, it was a no-brainer. Hopefully we have sort of proven that to everyone. There are so many great vendors from this area, but also I think forty other states are represented as well! Social media wise, what do you think helps you gain the most followers or readers? Facebook is huge for Country Living magazine, and our digital team is constantly fascinated by the Facebook algorithms. I love Facebook too because it is always an instant interaction. We will put a room up online and we think we know how readers will react, and, suddenly, we have 25,000 likes. Then, we will put a room up that we know readers will love, and then they don’t! It is an interesting way to instantly gauge reactions. Instagram is great, too. So if folks want to follow you how should we find you? I adore Instagram. I post probably sixty percent baby photos. I am also on Facebook and, eventually, I will get to Twitter. So, do you like to take photos? Yes, it’s fun. When you do this for a living, you always want to snap pictures and be able to appreciate what other people create like these perfect booths and venues….I am constantly snapping things that we produce but also things to admire. Forest Home Media & the Nashville Influencers focus on home, food, and garden. What is your passion – home, food, or garden? I would say home. I have a lot of random decorating I do. It is hard to choose, but that is what we focus on here at Country Living. Garden also feeds into that, and you are constantly putting a meal on the table every single night. But, I love decorating and can’t get enough of that. When I am killing time, I love reading decorating magazines. How do you work with bloggers? We feature a lot of bloggers’ houses. People put so much into their homes and I love being able to see into them… We might stumble across a vintage house through a blog and then reach out. I’m also definitely sensitive to what I see. There will be stuff all over Pinterest, and then I’ll see it in a magazine, and I’ll want to make sure we give credit to bloggers. We are very diligent about doing that. The number one question: How do you get into Country Living magazine? Send us an email. We try to read every single email. Ours style director is Jami Supsic. Her email is [email protected]. Use your iPhone to take pictures… there are never too many shots. More pictures are better… we are always looking to build our shot list. Usually when we shoot a house we have 8-12 key shots. Please just send us pictures to that email address and hopefully someone will get back to you. Next up for Forest Home Media is the Nashville Symphony Show House Sneak Peek Tour and Garden Party with Southern Living Contributing Garden Editor Carmen Johnston, PBS Volunteer Gardener Troy Marden, and the iconic Miss Daisy King. Contact us via [email protected] if you are an area writer and would like to join us on Wednesday, June 10 from 10 a.m. until noon. The event is free but we do have limited spots. Built by Castle Homes, 2012 Southern Living Custom Builder of the Year, CLICK HERE for more information of the project and event tickets. The home is open for tour daily June 12-28, 2015.